Live quality webcasts and online summit's with EURObizz. Welcome to the broadcast channel of EURObizz. You will have access to high quality content, Senior Keynote Speakers, a large European network, our European Online B2B Marketplace and our Elearning Platform. In 1996 Bill Gates (Microsoft) made his famous statement with his article titled 'Content is King'. And how right was he with this statement. Content marketing is more important than ever before. In this webinar we will look at a case of Exact Software. We will interactively discuss things like the culture of content and how Exact Software was able to triple their business of Exact Online in the past few years! A spectacular result that, of course, is not just a matter of course. This resulted in a takeover by the private equity company Apex and made Exact into an American company. 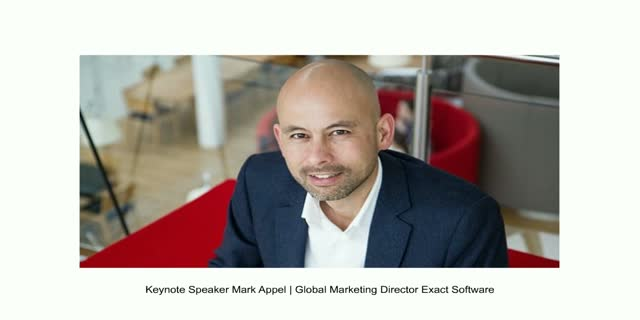 Our Keynote speaker is nobody less than Mark Appel, Global Marketing Director of Exact Software (operational in 6 countries). He talks about his experiences in setting up a content marketing and demand generation strategy for Exact Software. His informal way of speaking and his seniority will definitely inspire you. In 60 minutes EURObizz and BrightTALK will showcase you on the journey of Exact Software and what the lessons you can distillate from that. This is something you don't want to miss.